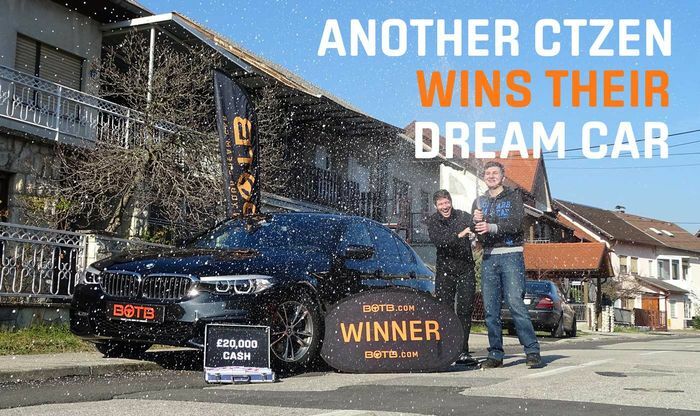 19 year-old CTzen wins a BMW M4 & £20k cash! Two weeks ago 19-yr old Stjepan Miksa was behind the wheel of a Ford Fiesta as he took his driving test…today he’s climbing into the driver’s seat of a £60,000 BMW M4 as Dream Car Winner number 406! Christian surprised Stjepan with the good news at home in Zagreb, Croatia where his brother and dad were on hand to join in the celebrations. The champagne flowed even better when Christian popped open the boot to reveal £20,000 cash as well – or rather 169,328 Croatian Kuna(!) – congratulations Stjepan! In case you’re not familiar with BOTB, we give away a car every single week guaranteed! You only need to be 16 to play and the competition is open worldwide. Sign up now and enjoy your first go for free! Recommended car throttle shop Worldwide Shipping In The CT Shop Car Throttle Submit Your Videos To Get Featured On Our Social Channels Blog BMW’S FWD 2-Series GC Is The Necessary Evil We Hoped We’d Never See Blog How The Right-Size Wheels Transformed Two Of My Cars Blog Why Is Ford Resurrecting The Defunct Puma Name On A Crossover? Blog I've Started Looking At BMW E30s Again: Please Send Help Blog Mandatory Speed Limiters Could Price Us Out Of Interesting Older Cars Blog Audi’s Ironic Move Back Towards Diesel Is Ridiculous But Intriguing Blog 5 Cars You Wouldn't Expect To Share An Engine With The Nissan 350Z Blog The New Ford Focus ST Has Advanced, But Has It Sacrificed Character?